For the first DVD release of the "Star Wars"-Saga, Lucasfilm did neither spare costs nor efforts to bring the best possible release to the fans. The original film material, which had already been remastered for the THX release in 1995 and the Special Edition in 1997, was again color-corrected. 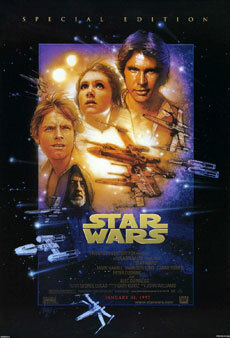 This wasnt done by LucasFilms but by Lowry Digital, an American-based company specialized in digital film restorations. Lowry Digital also restored the legendary moon landing footage from the "Apollo 11"-mission. Despite immense efforts to present the old saga in the best way possible, not all fans were happy with the DVD release. The DVD edition is based on the Special Edition, which was released in theaters and on video in 1997 and has been the cause of much debate among fans ever since. Only after massive protests by die-hard Star Wars fans and two years after the first remastered trilogy did Lucas Film decide to also release the original trilogy (the movies without digital effects). However, besides smaller changes, the second release is not anamorph but presented in 4:3, including the obligatory black bars. In order to use the full frame of a 16:9 TV-set, the picture thus has to be zoomed in, which lowers the picture quality significantly. However, putting all the blame on Lucas Film would not be justified: The old film footage, the original celluloid copies, simply don't exist anymore. As early as 1991 it was discovered that the complete material was in an extremely bad condition. Due to a flawed production, each film reel only had a life-span of approximately 6 years. Then they started to disintegrate. The material that was left was meticulously restored and thus, the THX-versions from 1995 are the only remaining original versions. On those, the Special Edition, which was again thoroughly remastered by Lowry Digital, is based. For the DVD release, the old footage (based on the already remastered THX and Special-Edition material) was not only thoroughly restored but also color corrected. This means that a lot of old effects appear in a totally new light. The difference in picture quality is considerable, but since it does not result in running-time differences or changes in the story, it is not mentioned in this censorship-report. Some distinctive examples of the color-correction (left side: Special Edition, right side: DVD-Edition). Since the Special Edition was only released on VHS and LaserDisc, one could assume that the overall image quality is lower. Therefore, for the sake of completeness, again a brief image matching between the DVD-Limited-Edition from 2006, the theatrical version and the DVD-Edition from 2004. (left side: DVD-Limited-Edition 2006, right side: DVD-Edition 2004). It is striking that at several points in the movie the picture of the DVD is wider than the one of the special edition. Here, the picture of the special edition has been embedded into the actual picture of the DVD. The picture of the special edition is compressed Thus, to keep the original image quality, only the right and the left side of the pictures are of interest. Comparison between the Special Edition and DVD-Edition. For the Comparison the German releases from 20th Century Fox Home Entertainment were used. Since the two version are cut identically, only differences in picture-editing and the audio-track are listed. All visual changes compared to the special edition. Differences in the Audio-Track of the English language version of the movie. The sunset on Tatooine has been overhauled. The ride of the sandspeeder through the canyon has been changed- In the older version it was just a brief white flash, now that flash is an actual CGI-model of the sandspeeder, which is probably only noticeable in direct comparison. Obi-Wans scream to chase away the Sandpeople was altered. The slightly turquoise coloring of the lightsaber has been changed to blue. This was done separately and is not part of the general color correction. The sandspeeder's flight to Mos Eisley has also been completely overhauled (except for the background) and the number of Womp-rats has been reduced. The pink tinge of all Mos Eisley scenes has been color corrected or rather removed. This was done separately and is not part of the general color correction. Han Solo and Greedo now fire their guns almost simultaneously (Solo still shoots first). The old CGI-model of Jabba the Hutt has been replaced with a newer one based on the model from "Episode I". However, the old model was not simply replaced. The complete motion sequence has been animated again from scratch. One of the biggest criticisms the special edition was Jabba's awkward scream when Han Solo walks around him and steps onto his tail. That has been changed. Jabba's reaction is a lot more subdued now. The destruction of Alderaan by the Death Star has been color-corrected. This was done separately and is not part of the general color correction. The lightsaber is now glowing in two different colors. The right color would actually be blue. Furthermore, the laser-beams of the droids seem to be a lot stronger now. The prison wing, originally a matte painting, has been enhanced digitally and the perspective was corrected. The eye of the Dianoga-monster has been overhauled digitally. The power label of the tractor beam has been translated from English into Aurabesh (the lingua franca of the Star Wars-universe). In the theatrical version and the Special Edition a lightsaber effect was missing. This has now been added. In the theatrical version, as well as in the special edition, two Y-wings vanish when they are still on screen. This has been corrected. The MG7-A proton torpedos have probably also been color corrected. This has so far not been confirmed by an official source (in contrast to the other color corrections)' but the differences in color are so striking that that is more than likely. The destruction of the Death Star has also been color corrected. This was done separately and is not part of the general color correction. When the sand crawler of the Jawas stops, C3PO now says something. Obi-Wan's scream to scare away the sand people is slightly different now. Stormtrooper: "There’s no one here." When the storm trooper is contacted via radio, some white noise was added. When one of the storm hits its head a sound was added. This was originally a blooper but has become an inside joke among fans, which caused Lucas to let Jango Fett, the genetic father of the storm troopers, hit is head in "Episode II"
The echoes of Luke's and Leila's voices have been amplified. The sound of Leila's blaster has been overhauled. Pilot: "He’s on your tail."